Get to know the Ngobe indians & the jungle's wildlife! 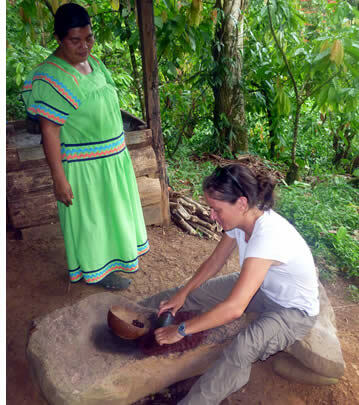 Tour Description: hike through the indigenous community, the cacao farm and the jungle, and learn about everything from growing cacao until artisan chocolate is created... and sample organic chocolate! Itinerary, Rates & Bookings: from $30 pp for Habla Ya students and from $35 pp for the general public. Arrive to Almirante at 9.30 a.m. or 1.30 p.m. 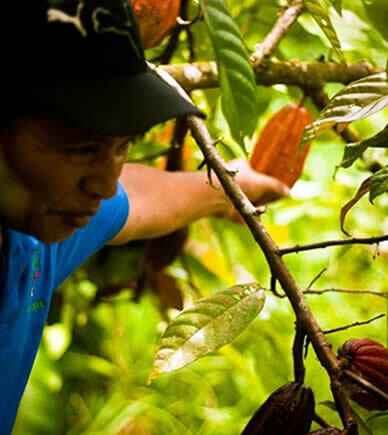 Authentic Geotourism & Fair Trade: learn more about the impact you'll have by supporting this initiative and joining the Oreba Cacao Plantation Tour. After meeting your guide at the dock in Almirante you'll take a short 10 minute ride to the Rio Oeste Afuera community where your chocolate tour begins. If the kids aren't at school they'll probably come over to greet you! During the initial part of the tour your guide will start pointing out several plants typical of the area and he'll explain what they're all used for. You'll be pleasantly surprised at how knowledgeable the Ngobe indigenous are about the natural world that surrounds them and how well they take advantage of everything that grows in the jungle (bring closed shoes, not flip flops). There are so many things in the jungle that you can eat, turn into clothes, use as tools or as medicines that there is no wonder that their carbon footprint is so low. The cacao plantation is actually uphill where the rainforest canopy provides shade and protection to the cacao trees from the intense heat of the sun, and that is exactly where you're heading up to. But on your way up, as you pass the first group of houses you'll observe and learn about the rustic methods employed to ferment and dry the cacao seeds, which are actually the fourth and fifth steps in the process. You'll get to see how the cacao seeds are left for fermentation and how they are dried by natural sunlight. To produce some of the world's finest 100% pure unsweetened chocolate, every step has to be carefully followed, and depending on several factors such as humidity, sunlight intensity and the daily temperature, the fermentation and drying process can be quicker or take more time. Only the truly experienced can achieve perfection and a lot of dedication is required: for example, in order to properly dry the cacao seeds and avoid mold building up, the seeds need to be stirred every 30 minutes during daylight at least for a week, if not more. After learning about the fermentation process and the drying of the cacao seeds, you'll continue to walk uphill under the rainforest's canopy. If you're luck enough, you might spot the resident sloth, a toucan or a poison dart frog (during the mornings you're more likely to encounter wildlife). Your guide will continue to explain the use of several plants and you'll finally reach a stop where you'll be surrounded by cacao trees. Here you'll learn about how the cacao trees are planted, taken care of during their growth, and how the cacao pods are expertly harvested. 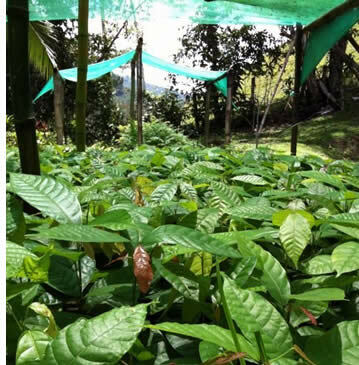 Depending on the farms' state (the older trees aren't as productive as the newer ones) you might also get to see tiny cacao plants in black plastic bags, getting stronger and awaiting to be planted. Nowadays cacao trees are planted along with banana trees and other fruit trees. This practice not only leads to healthier soil, but it also keeps the monkeys and bats happy and away from the cacao fruits themselves. 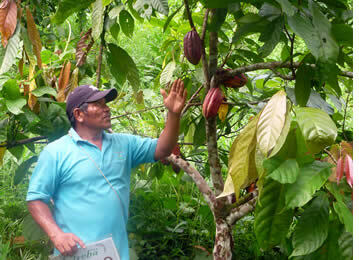 Growing cacao is a work of love and dedication. Cacao trees need constant care to prevent certain diseases from spreading and killing the production (with mortality rates of up to 80%). As no chemicals are used, all this has to be done by hand and entire cacao plantations have to be continually monitored on-site. Cacao trees don't have a proper season: they are always in various stages of fruit production at any time of the year(although there are times when there are more pods ready). When enough pods have ripened to make processing cost-effective, the farmers go around collecting the pods, open them up, remove the flesh covered seeds (which depending on the variety of the cacao is quite nice to eat itself), cover them with burlap in the fermenting bin, let them ferment for the appropriate time and then put them to dry. After the cacao seeds are dry enough (over-drying them ruins the flavor), the next step is to roast them. 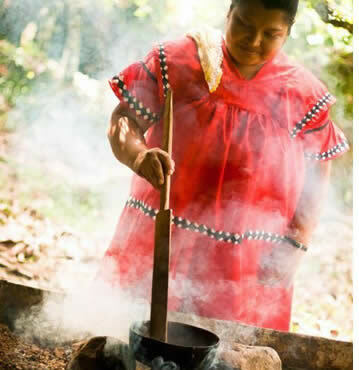 Although the indigenous use more practical equipment to roast and grind the seeds, you'll witness how it's been done traditionally with a pot over a fire, and then grinding by hand and stone. During the time it takes for the seeds to roast (you'll hear how they start to pop when they're ready), your guide will continue to tell you about how the cacao plant has an extraordinary history as one of the most important products for the Mayan and Aztec cultures (even used as currency), as well as other Central American tribes. The discovery of America led to the introduction of chocolate in Europe, transforming it into the product we all know today. In Bocas del Toro the cacao plantations used to be owned by immigrants from the Caribbean islands which employed Ngobe indigenous who eventually bought the land back and continued the production themselves. Even though Panama produces very little cacao compared to other countries, ours is of world class quality. Once the seeds are roasted, you'll get to sample some roasted seeds, which are actually known as nibs. At this point, you can already start feeling the pure cacao flavor, and now only the grinding part remains. You'll even have the opportunity to grind some roasted seeds yourself! After the seeds are grinded, a smooth chocolatey paste remains. Get ready for the moment that everyone has been waiting for: actually trying the chocolate out! And it's certainly a yummy treat, as the Oreba Chocolate is considered by Swiss experts to be amongst the finest chocolate in the world. Mix it with some sugar and milk, and you'll get milk chocolate, or just leave it without milk and you'll get dark chocolate. Or if you prefer to have it in its pure form, just refrigerate the runny paste that is left after grinding it and you'll get solid bars of rich unsweetened chocolate, about 50% cocoa butter and 50% cacao solids. This is what the Ngobe indigenous pack by hand with a truly artisan touch and get ready either to export to Switzerland or sell locally. 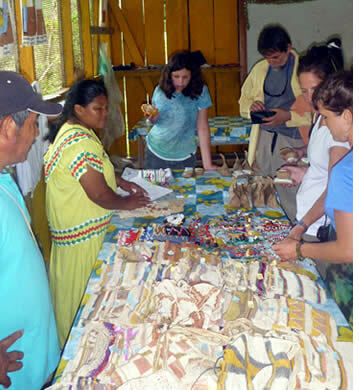 To end the tour you'll get a chance to visit the community's visitor center where they have hand made ornaments, clothing and bags on display for sale, as well as various forms of chocolate produced by the community. Even though the tour includes a 4 oz bag of whichever chocolate you'd like to take, feel free to purchase as much chocolate as you can (makes a great small gift to take back home). And if it wasn't enough you'll all get a chance to share a meal of local roots and tasty chicken, prepared with the locals' favorite recipe. * Prices are in US Dollars. The above prices are per person and does include Panama's 7% ITBMS Sales but does not include boat transportation to and from Almirante. Once you book the tour, it will be arranged for the guide to be waiting for you with a sign indicating the name of the tour (Oreba Cacao Plantation Tour) at the dock in Almirante at 9:30 a.m. or 1:30 p.m. The antioxidant properties of pure cacao are unlike any other. In Bocas del Toro there are several places where you can buy pure organic chocolate from other local producers as well, such as at Up in the Hill Farm in Old Bank, Bastimentos. The tour departs at 9:30 a.m. or 1:30 p.m. from the public docks in Almirante. Once you book your tour, the guide will know when and where to pick you up. Once you're greeted at the dock you'll be taken on a 10 minute drive to the community of Rio Oeste Afuera from where your tour starts (for a tour description, please click here). As part of the tour takes place under the tropical jungle, closed shoes (not flip flops) are recommended. The tour normally lasts 3 - 3.5 hours after which you'll be taken back to the docks in Almirante so that you can take a boat ride back to Isla Colon. If you're a vegetarian or have a special diet, please let us know so that appropriate food for you can be prepared. More than 30 Ngobe indigenous families are united into the Oreba Cooperative and work together to ensure that only the highest standards are achieved to produce 100% organic cacao. The proceeds of the tour are distributed amongst the community with assigned percentages that go directly to the local school fund, future projects (for tourism and for the farms), back to the producers themselves and to all of those that collaborate with the tour, including the guide and those who assist him in demonstrating the roasting and grinding of the cacao seeds, as well as to those who cook your lunch or dinner. 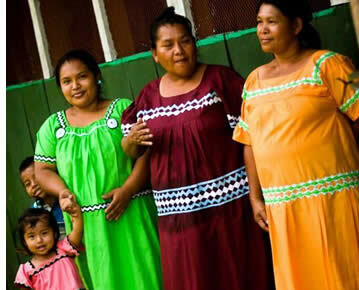 These are small cacao producers. Each of these farmers own between 1 and 4 hectares of land each and like to keep it that way as one family really can't take care of more than that amount of land. The Oreba Cooperative is continually working into educating other producers to go organic and is continually adding members to its organization. 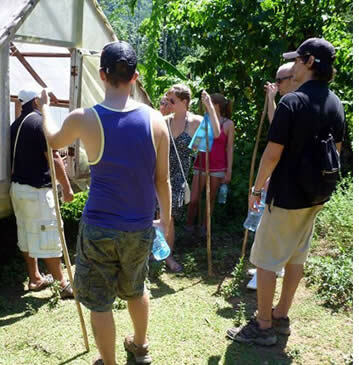 As you can see, this tour is not only eco-friendly but also truly enhances the community's values and its people, and that is what geotourism is really about. You can also support other cacao producers around the world if you only purchase and consume chocolate that is made from cacao bought through fair trade practices (well paid and well taken care labor) and organically grown (without harming the environment). 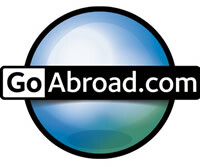 Authentique tourism that improves the locals' standard of living! Contact us!